1) whereas the supraglacial and englacial zones comprise ice formed by compression and recrystallisation of snow that accumulated at the surface, basal ice is commonly formed either by the freezing of water at the bed of the glacier, or by metamorphism of surface-derived ice by thermal, strain and hydraulic conditions close to the bed. 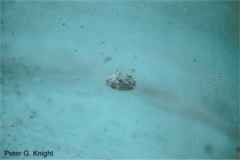 Because of this, the chemistry and the physical structure of the basal ice are different from the ice above. 2) whereas englacial ice usually contains only debris derived from the glacier surface, the basal layer can contain large amounts of debris derived from the bed of the glacier. 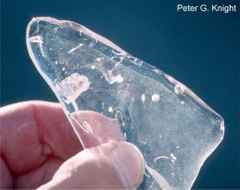 This affects not only the chemistry and structure of the ice, but also its rheological properties and its geomorphic potential. Where the glacier bed is melting, the basal layer may be thin or non-existent, but where melting is limited and basal accretion occurs, basal ice several tens of metres thick may develop. The thickness of the basal layer can be increased by subjacent accretion of ice or by compressive deformation. The upper boundary of the basal zone is the upper limit of ice directly affected by basal processes, specifically: (i) formation of basal ice; (ii) entrainment of subglacial sediment; (iii) flow through the vein network of basally derived water. Two major and related issues in the description and interpretation of the basal layer are the processes by which the ice is formed and the processes by which rock debris from the bed is entrained into the ice. 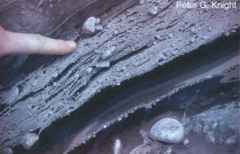 Entrainment of debris at the bed occurs by a variety of processes including regelation, congelation, flow of water through the vein system, shearing and folding. Processes by which basal ice can be formed can be divided into: (1) processes of formation and accretion of new ice at the base of the glacier; and (2) processes of metamorphic alteration of existing ice close to the bed. "Most of the ice in glaciers and ice sheets is formed by the firnification of snow at the glacier surface. 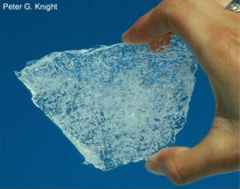 The ice inherits many of the characteristics of the snow, and throughout the accumulated thickness of the glacier the characteristics of the ice can be used to reconstruct surface conditions at the time of formation of the ice. In many glaciers, however, there exists a thin basal layer in which the ice is conditioned primarily by processes operating at the glacier bed. Characteristically, this layer comprises ice and debris entrained from beneath the glacier, and also ice that is derived from the surface but has been diagenetically modified by thermal, strain and hydraulic conditions close to the bed. This basal ice constitutes a lower boundary layer within the glacier, and as such is critical to a range of glaciological issues including rheology, hydrology, and geology. Where the glacier bed is at the melting point, the basal layer may be thin or non-existent, while in cold and sub-polar glaciers basal ice up to several tens of metres thick may develop. The basal layer is accessible via boreholes drilled through the glacier to the bed, in subglacial cavities, and where it is exposed at the glacier margin. Basal ice is important to Quaternary scientists as well as to glaciologists, geologists and geomorphologists. It reflects processes that operate in the inaccessible subglacial zone, it influences glacier dynamics, it contributes directly to glacier sedimentation, and at present it represents a barrier to the downward extension of the climate record to the bottom of deep ice cores. The presence of debris in the basal ice, and the processes by which it is entrained, are crucial to processes of glacial erosion and deposition. The basal layer is fundamental to realistically formulated models of ice sheet behaviour and the development of glacial landscapes."